A woman was arrested this week after video showed her knocking over a large crucifix inside a California church, causing thousands in damage. 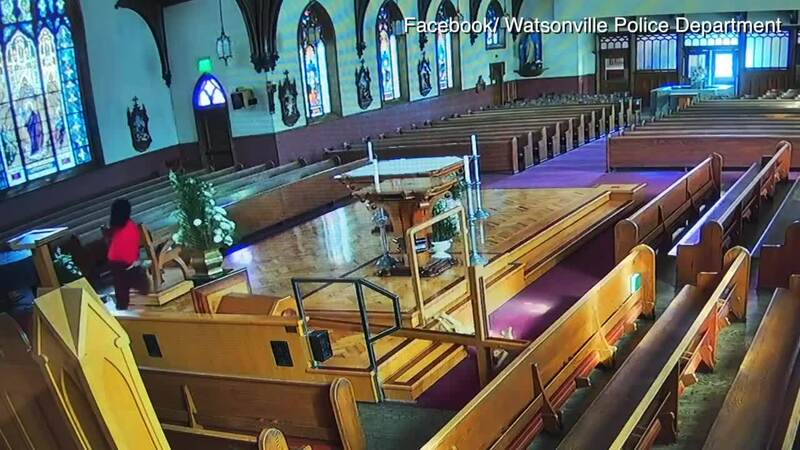 WATSONVILLE, Calif. (KION/CNN) — A woman was arrested this week after video showed her knocking over a large crucifix inside a California church, causing thousands in damage. Authorities in the town of Watsonville says this video shows 23-year-old Jackeline Chavira knocking over a 15-foot crucifix at Saint Patrick's Church. Police say she caused up to $15,000 in damage. Despite vandalizing the church and a nearby religious store, police say Chavira will not be charged with a hate crime. "For a hate crime, you actually need a human being as a victim. In this particular case, we're dealing with vandalism and there is a section (which) is specific for places of worship. In 2016, she was arrested twice for being under the influence of drugs, so it is possible that this time around, she was also under the influence of drugs," said Watsonville Police Department spokeswoman Michelle Pulido. Chavira is charged with vandalizing a place of worship, defacing property, burglary and disobeying a court order. She is being held on $25,000.